This is the main category for all the posts. ﻿CeFlix Tunes – Your online Premium music digital handshake that pays you for your plays anywhere! We are constantly evolving as a music streaming service with our latest iOS upgrade, designed to bring the maximum spotlight to your brand experience, increased plays, amplified followers, and more money in your bank account, all in one place. As the leading platform in the gospel music industry, this introduction will allow creators and listeners to connect in real time, giving a seamless experience for fans and fellow artists to be in one place and navigate their content flawlessly. The new layout promises to instantly level up your presence as an artist, from uploading your music to generating instant income to your bank account, CeFlix Tunes empowers you to the next level in your music career. Now, with the improved Premier package, you will get payouts every time your music is streamed and played from all over the world on our platform, at no added cost to your Premium account. Our direct monetization program on the CeFlix Premium plan is available at no additional cost to all eligible Premium subscribers, curators of original music, artists with zero copyright strikes, and monetizable track plays. Artists will be notified via email and notifications in their account profile. In addition to our easy revenue generation stream that reigns supreme, you’ll get the best tools to level up your career, so that you can keep growing your audience and make even more gospel music to inspire and distribute. Additionally, you can also actively use the tools to promote yourself. Update your profile photo and header page in your account profile to correspond with your latest look, even create a smart bio that fans can relate with, and once your profile is looking its best, you are good to go on the leading gospel music streaming platform. If you don’t have an iOS device, don’t sweat it, chances are a lot of your fans do, therefore it’s a win-win! Not to take the trophy from social media, as an artist you know the importance of visibility, to be constantly seen and heard is key to every brand that wants to grow, with the new CeFlix Tunes iOS and Android, your music digital handshake is hot and ready to shake tables for your music career to be Turinoniown! We got your visual and auditory introduction to followers, fellow artists, and industry executives covered, and also first class publicity and wide audience reach from our teeming number of users and subscribers on our web and mobile app. They say first impression matters, but with CeFlix Tunes, we got all shades of your impression covered with a sound difference on our iOS and Android design. Want more music and celebrity trending news? Follow CeFlix Tunes on Facebook and Instagram. Download the CeFlix Tunes app at www.ceflixtunes.com and tune in to the Non-stop music channel for a healthy dose of sound celebration. The CeFlix Tunes app is available for all Android devices in the Google Play Store and iOS users worldwide. Light Series﻿ – Real conversations that connect and builds Faith! Train up a child in the way he should go and when he is old, he will not depart from it! Today, these model youths in their prime are fulfilling this scripture. “Don’t let anyone look down on you because you are young, but set an example for the believers in speech, conduct, love faith, and purity. Today’s generation is not joking with their pop culture and lifestyle either. Therefore this youthful gospel coalition has decided to lead meaningful conversations, share their Faith, and build relationships that projects and propagates the gospel of our Lord Jesus Christ. 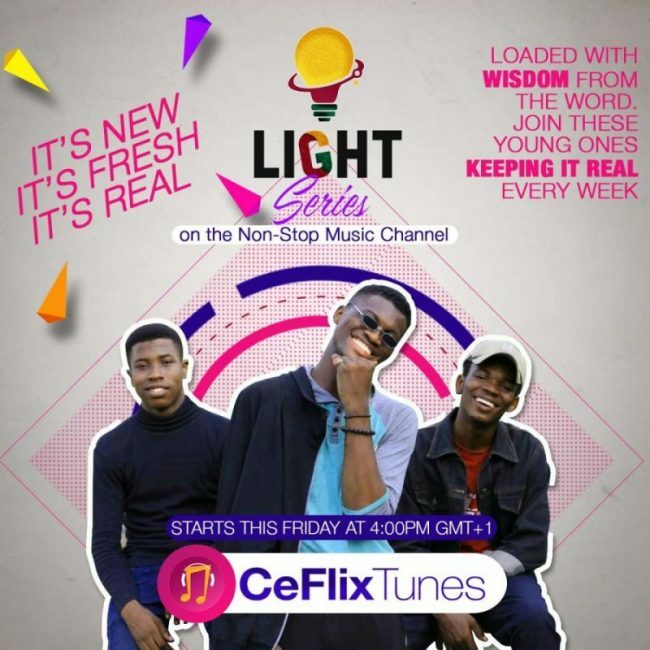 They are a beacon of light and hope to others, and they are starting their first series, live on CeFlix Tunes, Non-stop music channel, the channel that delivers first-class gospel music. As a young person in today’s world, the hardest thing you may face is to have a real Christian conversation with another young person full of life and bursting with energy, and yet that is the key element to absolute satisfaction. Therefore, when you attach faith into the equation, your conversation literally goes from life-enriching to life-TRANSFORMING. These youngsters are ready to give their conversations depth beyond measure when they speak about their experience of Jesus. This changes everything for this generation as these youths are taking a stand with their actions, words, attitudes and even dressing. For young people who are constantly faced with the continuous buzz and noise of fashion, pop culture, entertainment, and social media, standing out for the gospel can be quite a challenge, especially among their fellow peers. It’s easier to say you believe in Jesus and more difficult to actually act as you do. This army of youngsters on this light series understands this. They welcome the challenge after sitting under the tutelage and wisdom of Gospel Giants in the Believers LoveWorld Inc, they are bursting with courage and passion to be prime examples of young people, who are living out their faith in today’s culture. The show is going to be an amazing experience for young people all over the world who are tuned in. In an age where sin and temptation have gone digital, easily accessible with just a snap of a finger or touch of a button, the light series promises to provide scripture inspired answers and hope for young people who have decided to make a difference with their lives and STAN with the Gospel. Jesus has informed us that he is the way, truth and life, therefore, the only way to do right with your youth is to offer it whole for the Glory of God and service to the gospel. Living out the gospel is the calling of every Christian, regardless of age, therefore, CeFlix Tunes is partnering with today’s young generations, being a young platform itself, to be prime models for young people rising above worldly pressures to be an example in today’s generation. It’s real, it’s fresh and it’s loaded as advertised! Tune in and spend quality time with the multitalented and entertaining Based on Grace (BOG) crooner and OAP of CeFlix Tunes, Non-stop music channel, @quizthagreat! Get the CeFlix Tunes app and listen in on the music channel for this amazing program holding every Friday from 4pm (GMT +1) West African Time. Gospel Artist’s relationship with CeFlix Tunes is unprecedented! The relationship between the biggest and trending Gospel artists and the number one Gospel music app that delivers non-stop first class gospel sounds 24/7, is unlike anything in the history of Nigeria’s entertainment media and music industry. Gospel music is no joke indeed and the world is beginning to take note. 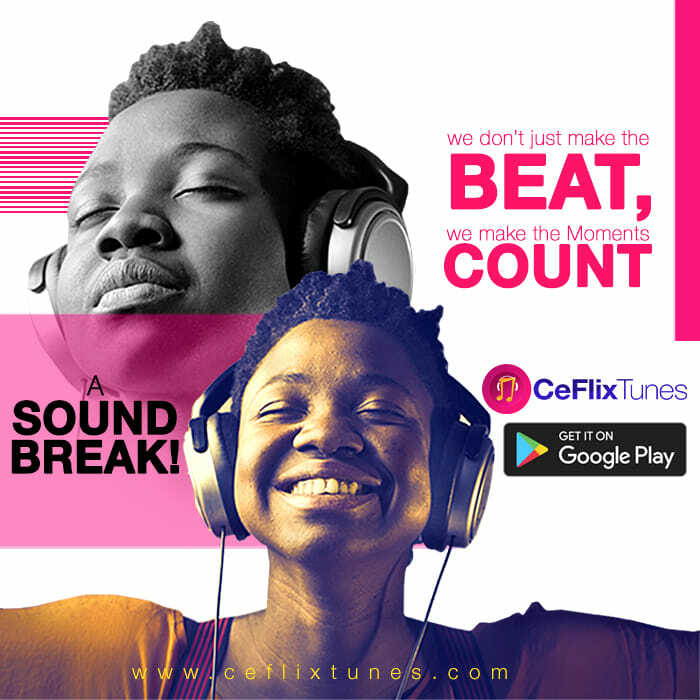 CeFlix Tunes is bringing the focus back to Gospel Music and making it a serious business with Sound Difference, proving every supporter of gospel artist and music lover right! Gospel artists are beginning to realize the importance and relevance of a sound partnership with media platforms to showcase their other side to their fans, the side most people don’t get to see beyond the studio, musical videos and celebrity status, and connect on a deeper level. Therefore, what better platform to rub minds with than CeFlix Tunes, Nigeria’s first and foremost online music streaming service. The experience can only get better. 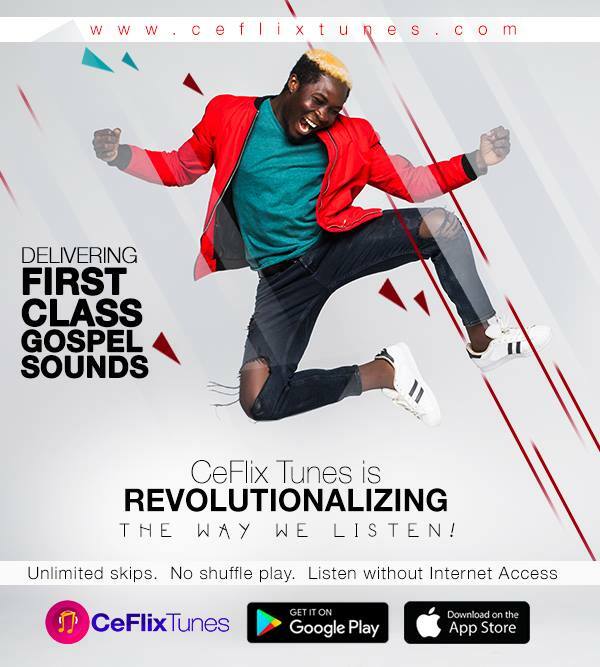 CeFlix Tunes is carving a niche for itself as the number one gospel music streaming platform this 21st century, by adding the best to the music experience. Imagine an app that monetizes and delivers not just music but first class gospel sounds to artists and music lovers, giving them a home and a family to share and earn from the many benefits and luxury that we offer to every class of artists and interested parties. On the Non-stop music channel in the CeFlix Tunes app, Quizthagreat live session segments are slowly becoming a household name for the energy, inspiration, and action it is bringing to the table. The show has been promoting the success and stories of gospel giants such as @testimony, @israelstrong, @samsong, @MrNoble, @TB1, @sunnywillz, @eniola, @soltune, @danielmylez and a host of many more gospel artists lined up and excited to come on board and share their personal story and connect more with their fans all across the world, through CeFlix Tunes Non-stop Music channel. We have had fans reacting and responding positively to these segments hosted by @quizthagreat, with calls and text messages coming in live on the show and on all our social media platforms going frenzy. Fans have been calling and texting to say just how much blessing and inspiration these artists have been to them, what advice they would give to aspiring artists and what inspired them to go into gospel music, with lots and lots of interesting things to learn and discover. Winter indeed has come for Music and CeFlix Tunes is bringing the heat right to the dance floor. Want more music and celebrity trending news? Follow CeFlix Tunes on Facebook and Instagram or tune in to the Non-Stop music channel for a healthy dose of sound celebration. CeFlix Tunes Guarantees a better musical world! CeFlix Tunes is bringing the world right within your finger tips with sound difference. It’s no secret that there has been an increase in the number of online music streaming platforms out there with lots of features catering to the many interests of music fans and artists. Many of these streaming services have not been a top choice for audiophiles over the years. The story is changing and the change is coming from the gospel music ministry and industry. 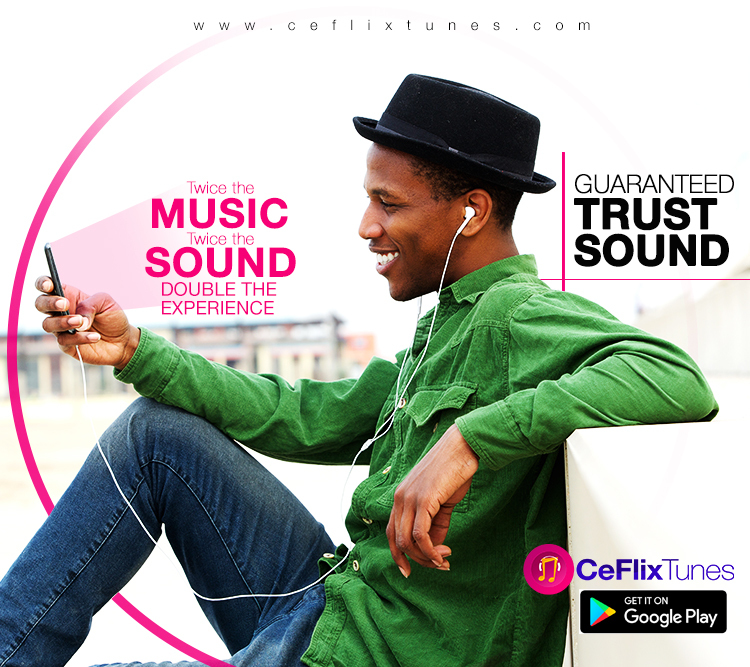 CeFlix Tunes is not slacking in its promise to delivering a sound difference as it has just increased the tempo a notch or two, by delivering a well-balanced and satisfying sound in a very comfortable form, for every Gospel music artists and music lovers out there. Hungry for good music, then CeFlix Tunes is the right place to come and have a feel of a solid musical experience, hot and always available to get you up on your feet and moving your body. CeFlix Tunes delivers exceptional sound in a comfortable and user-friendly App design that unifies all generations and genres in one space. 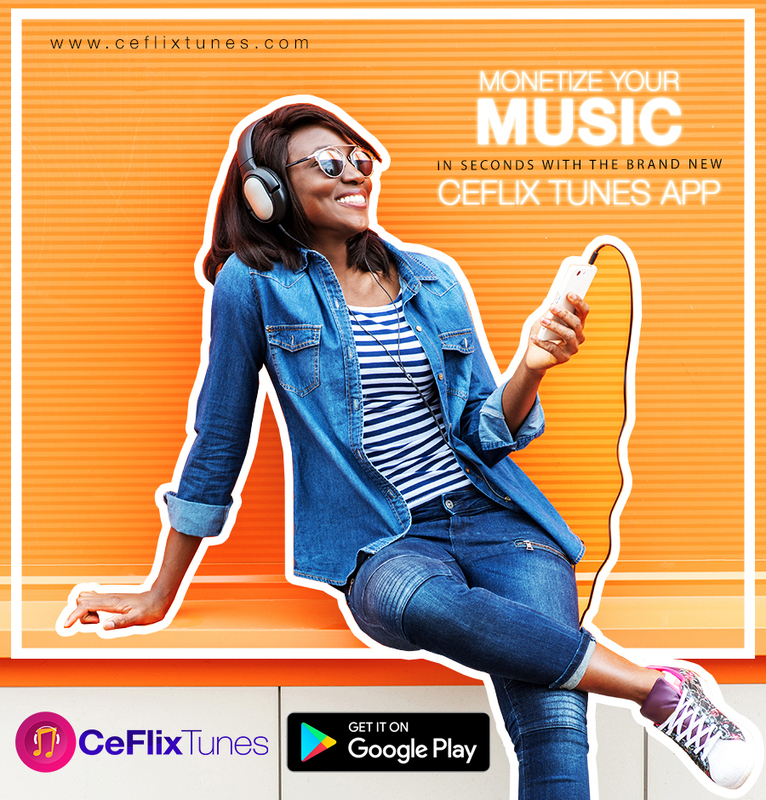 Sell your music on CeFlix Tunes and get paid with no hassles or fear of privacy as the App got you covered. You won’t find an app filled with adverts, restrictions, and costs that might be daunting to use. CeFlix Tunes provides a home for great sound with features that will enable you to take your music with you everywhere you go. The app comes as a complete package, with extra features even on the free mode, like unlimited skips, no shuffle, save for offline listening, buy or download from a solid curated playlist tailored for your listening pleasure, in a nutshell, you get premium service even for free on the CeFlix Tunes app. Unbelievable right? Get so much more on the premium plan, I mean if you can get so much service free, just imagine what you can gain as a paid plan user or artist. For most music fans, the problem with most of the top streaming sites is that they aren’t focused on the artists and fans but their focus is on the music, which isn’t too bad since music is the currency that these streaming platforms understand. Nevertheless, the gap and disconnect can be frustrating, because, when the focus is not just on the sound but the listener, it helps drive a stronger relationship and partnership while fostering a deeper engagement with other music lovers, paving a way to discover new songs and artists. CeFlix Tunes focuses equal attention to the music and the artists/fans, offering a home where you can share your musical tastes with others in a fun way and discover new music trends and new friends. Our select curated playlists leaves you feeling at home and brings you a sound closer to your dreams and career. The different packages and premium services offers artists an opportunity to interact more with other music artists by staying up-to-date with the latest music and trending songs and get paid for their music. Premium Music at your fingertips for just a token! WHAT MAKES US THE MOST TALKED ABOUT APP IN TOWN! It’s more than an app for us. It’s more than a business partnership, much more than a service. For CeFlix Tunes, music is a relationship. It’s a force that connects and inspires laughter, dance and sweet melody in the hearts and souls of even the most heartbroken individual. CeFlix Tunes is emerging as the most talked about App by other music industry pundits and artists, becoming recognized as a leading player in Africa’s Digital market. With the latest upgrade and iOS version, CeFlix Tunes is reinforcing its nonstop contribution to Africa’s and indeed global content distribution ecosystem. With its exceptional and user-friendly CeFlix Tunes application, which delivers easy access to an unlimited number of songs, videos, and entertainment hubbub, the app has recorded a significant increase in the number of users and artists vying for a spot to come on-board. The ease of use and simplicity is a plus, with a colorful user interface and innovations, especially its noteworthy influence in delivering music easily to millions of artists and users, eventually creating more market for mobile music consumption, while assisting and supporting artists by protecting their interest and career through the protection and safeguarding of their intellectual property and right legally and commercially. CeFlix Tunes guarantees assurance to artists who are seeking to monetize their music independently or otherwise. The whole world isn’t just watching…They are Tuned in! 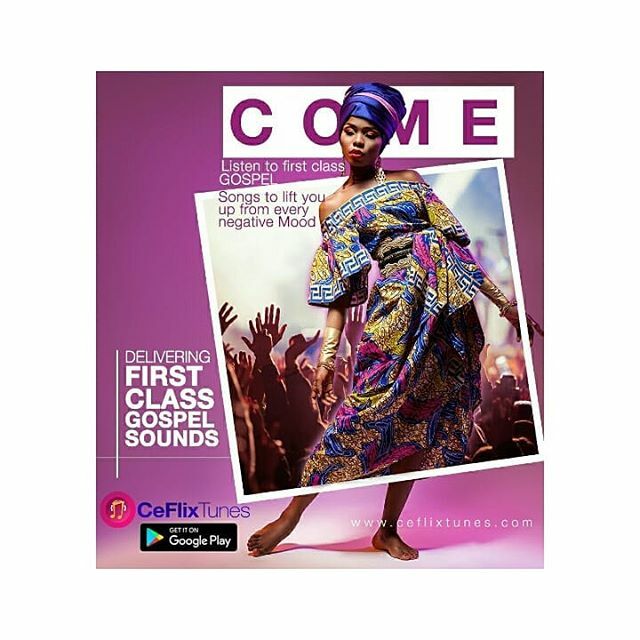 The addition of CeFlix Tunes non-stop music channel to the platform is a unique milestone achievement for the app, with a dedicated team working tirelessly to bring first-class gospel sounds to listeners worldwide, many more users are now using the app to listen to music, sign-up on the app, download and buy music, upload more songs and even get the latest gist on entertainment from the blog posts on the site, everyday. The various segments and live sessions on the Non-stop channel are keeping every Gospel Artist in the country and beyond on their feet, asking for more. Everyone is talking about CeFlix Tunes and how it is making a sound difference. No matter how lost you feel, our music will find you and bring you home. Delivering first-class gospel sounds anywhere you are. What is gospel music to you? Is it a minister, a teacher, a friend, a lover? Maybe an escape or a genuine definition of you! Music could be all this and more to you as an individual that is the beauty of music. It is different things to different people at all times; there is a sound for every mood and every state of mind. But one unifying factor we can’t shake off is the fact that sound is life without which we would all float in a quiet and dark universe. You are not really you when you are quiet but when you are free to express yourself the way you want, then your true personality is revealed and that is what music does, it opens up doors of unlimited expressions. What you listen to has a very sound effect on your life. If you must act right you must listen right. Gospel music inspires and influences one rightly, it is a teacher, it motivates and pushes you to be different, act different and sound different. Just like secular music, Gospel music comes in different genres and sounds, it could be rap, reggae, pop, RnB but then the underlying theme is the gospel. Gospel music is beyond sound, it is sound with a difference designed to reach the world and make the presence of God tangible and physical in the hearts and minds of listeners and music lovers. It is hard to resist great sounds especially when It doesn’t judge, It doesn’t condemn and most especially, it doesn’t stop inspiring you to greatness. The person who said freedom is not free, I bet they didn’t try sound. Sound is free and with CeFlix Tunes, you will discover a sound difference in every beat, tune and playlist. So come on board today, join the community where sound matters and discover a sound difference. CeFlix Tunes, we customize and personalize the right sound just for you. Our believe is that if you can hear it then you can be it! Want more music and celebrity trending news? Follow CeFlix Tunes on Facebook and Instagram. Download the CeFlix Tunes app at www.ceflixtunes.com and tune in to the Non-stop music channel for a healthy dose of sound celebration. Does the app take much space? The app is really light and takes up only 23Mb of space in your phone memory except of course you start using the “download” feature which will require more space to save the songs you download on the app but not available for transfer to other devices. How can I promote my songs? You can promote your song, album or your profile to the CeFlix Tunes platform through an easy to use self-service portal at a token. Fill the form, register and start uploading your music immediately. One hour of music playback will use around 10MB of data with the CeFlix Tunes audio quality settings. You can play around 24 hours of music for around 240MB of data usage. Even in online streaming mode, CeFlix Tunes has a pretty efficient data consumption algorithm. What are the benefits of being a premium plan user? The CeFlix Tunes Premium plan, gives you unlimited access to everything on the free plan and lots of exciting and amazing sound musical experience, whether you’re listening on mobile, or tablet. As a premium plan user, you can listen to every song on the service including premium tunes uploaded by artists under the premium category. You can hear high-quality music, listen to premium artists on CeFlix Tunes radio stations, stay on-top of the latest entertainment gists and first class access to new products and services, also you can access more content like music videos and tune in on live sessions with artists.